The Crufts international dog show attracted some 21,000 canines from around the world as they competed for a string of prizes at the National Exhibition Centre in Birmingham. And day four was no except as it brought quite the spectacle from Mary Ray’s last performance with her collies to a protester being wrestled to the ground after the Best in Show winner was announced. The morning began with the Agility Championship Round 1 for Jumping at 9.30am GMT followed by Good Citizen Dog Scheme Display and then Agility’s Round 2. In the evening Ms Ray gave her final Crufts performance with her collies Lyric and Frankie, drawing a huge cheer from the crowd. The highly anticipated Best in Show award brought a surprising twist as they announced the reserve before the winner. 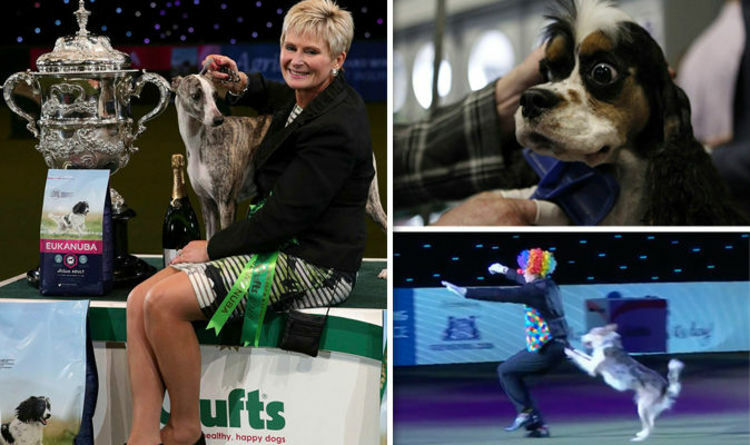 The apparent controversial decision brought a rumble and a few boos from the Crufts crowds. Whippet Tease was crowned Best in Show with the Gundog pointer champion Kanix Chilli being named reserve Best in Show for 2018. The decision was met by a huge applause from crowd before an intruder stormed onto the Crufts arena and charged towards the winner. Owner Yvette Short moved to protect her dog as the protester headed towards the coveted trophy. He was wrestled to the ground by the dog show’s staff and taken away from the arena. The crowd broke out in a chorus of boos at the intruder, who appeared to be carrying a sign was led away. A Crufts spokesman said: “It appears that protestors from PETA gained unauthorised access to the ring in the main arena at Crufts, and in doing so scared the dogs and put the safety of both dogs and people at risk in a hugely irresponsible way. “Our main priority at the moment is the wellbeing of the dogs that were in the ring, who are being looked after by their owners and show officials.